Apply now and receive a decision in about one minute! Need Help Shopping for Your New Ride? Use AutoSmart! AutoSmart makes auto buying easy. The AutoSmart Web site gives you access to everything you need to make your auto purchase complete! Purchasing a used vehicle from a private party? Click here to apply for your loan. For pre-approval to purchase a new or used vehicle from a dealership, click here. *Annual Percentage Rate. All loans are subject to approval. Some restrictions may apply. Primary borrower must reside within San Joaquin, Calaveras, Amador, Stanislaus or Tuolumne counties. Put more fun in your free time! CSCU offers affordable rates and extended terms. New & Used Boats & RV's – Low Rates and Terms up to 180 months, Financing on New Boats & RV's up to 90% of Purchase Price plus tax & license. Financing on Used Boats & RV's up to 90% of purchase price, plus tax & license or 100% of wholesale as indicated in the Kelley Blue Book, whichever is less. Private Party Sales may require an outside Appraisal. New Motorcycles, Jet Ski's, and All Terrain Vehicles - Low Rates and Terms up to 72 months, Financing up to 100% of Purchase Price plus tax & license. CUDL dealers will give you great pricing on your next vehicle and you can apply for your CSCU auto loan right at the dealership. You'll receive the same low rates and all the benefits of a CSCU auto loan—because that's exactly what you're getting. CUDL makes it more convenient, because you can apply for your CSCU auto loan at the dealership any time—even on Sunday. Find a participating CUDL dealer near you. AutoSmart makes auto buying easy with an all inclusive Web site, which gives you access to everything you need to make your auto purchase complete! Central State Credit Union offers the CUDL, AutoSmart and Kelley Blue Book services as a member convenience. Central State does not endorse or warranty any of these entities. Members use this service on a voluntary basis. All loans subject to credit approval. GAP from CSCU covers the possible gap between the amount your car is worth and the amount you still owe, in the event your car is totaled or stolen and unrecovered. GAP also pays your insurance company's deductible up to your policy maximum. It's a great way to ensure you won't be stuck paying for a vehicle you no longer have. Plus, it's a lot of protection for a small cost. Consult with a Loan Representative to discuss GAP in more detail by calling (209) 444-5300 or (800) 675-5114. Do You Have Holes in Your Safety Net? Are you among the millions of Americans who live paycheck to paycheck—saving little from each paycheck to secure a financial safety net? Central State Credit Union wants to offer you a safety net to help protect your assets. Members Choice protects your loan payments. It is a safety net that cancels or reduces debt obligations when a protected life event like disability, death or involuntary unemployment make paying off your loan a challenge. Members Choice fees are based on a group rate and you buy only enough protection to cover your loan balance. And tying protection directly to your loan means you'll have exactly the right amount of protection—no more, no less. Think about your future today. Choose to protect your loan payments with Members Choice Borrower Security. Call (209) 444-5300 or (800) 675-5114 and ask about Debt Protection on your loans. Debt Protection is a product offered by Central State Credit Union. Enrollment in this debt protection product is voluntary and not required to obtain a loan. 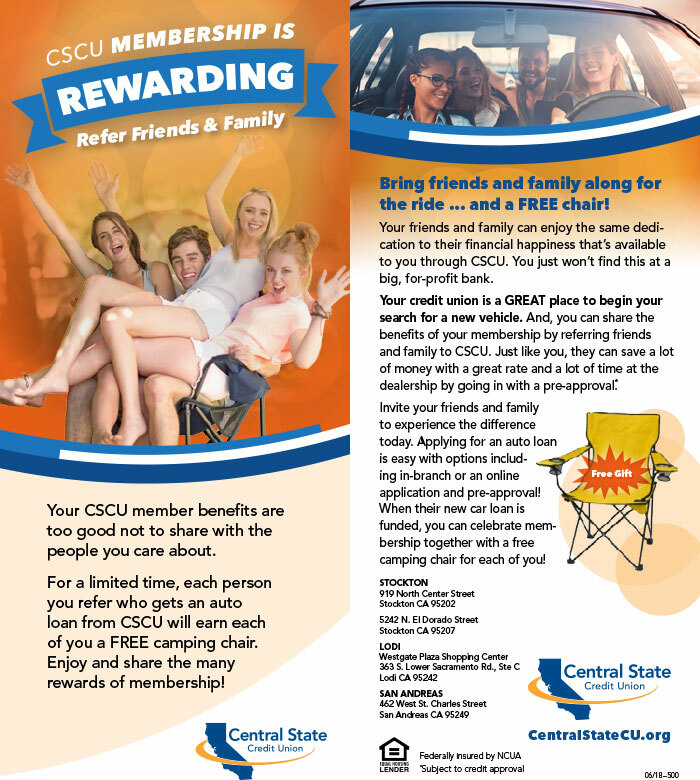 Please contact (209) 444-5300 or (800) 675-5114 for additional information on benefit maximums, eligibility and limitations.